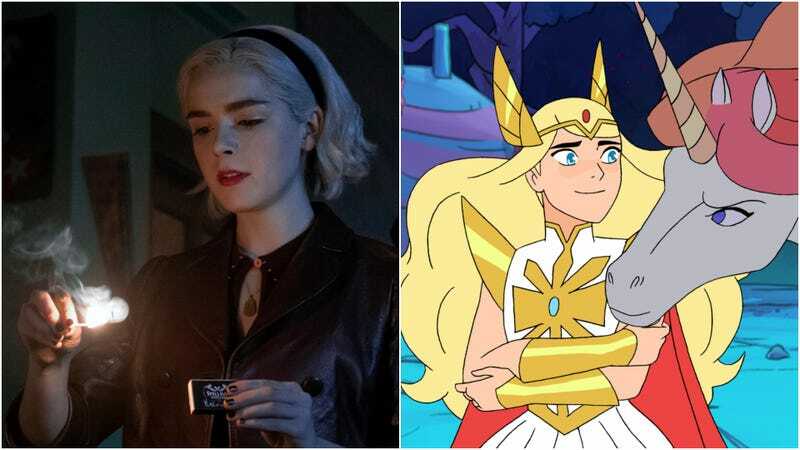 For American audiences, the biggest originals this month are probably the sophomore seasons of The Chilling Adventures Of Sabrina (April 5) and She-Ra And The Princesses Of Power (April 26), in which plucky young women discover their personal power through the magic of female friendship and/or Satan himself. Fans of docuseries also have a couple of interesting binges to look forward to, as the ReMastered series picks up with a new look at the life of bluesman Robert Johnson (April 26), and the company fulfills its obligatory 4/20 content quota with Grass Is Greener, a look at the complicated history of jazz, hip-hop, and racist marijuana laws. On the acquisitions front, it’s a good month for fans of Oscar darlings past, as Bonnie And Clyde, All The President’s Men, The Imitation Game, and an expanded version of The Hateful Eight all hit the streaming service. Plus, after months of hearing us talk about it, Netflix subscribers will finally have a chance to check out Lee Chang-dong’s Burning on April 29. Just be sure to finish your Bond binge before almost a dozen movies featuring the iconic superspy leave Netflix on April 1; if that’s not really your speed, check out the stylish French cannibal horror film Raw before it departs on April 4.